Coffee had been drunk in Britain long before tea arrived in the 17th century, and these emporiums retained the name 'Coffee House' in the 19th century, even though many of them traded solely in tea. They were the forerunners of gentlemen’s clubs, and upper class gentlemen would gather in establishments like the Yorkshire Coffee House to socialise and discuss politics. 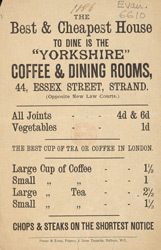 Newspapers and periodicals were provided, as were inexpensive meals. It was this relative affordability that encouraged the middle class merchants and professionals to dine there.